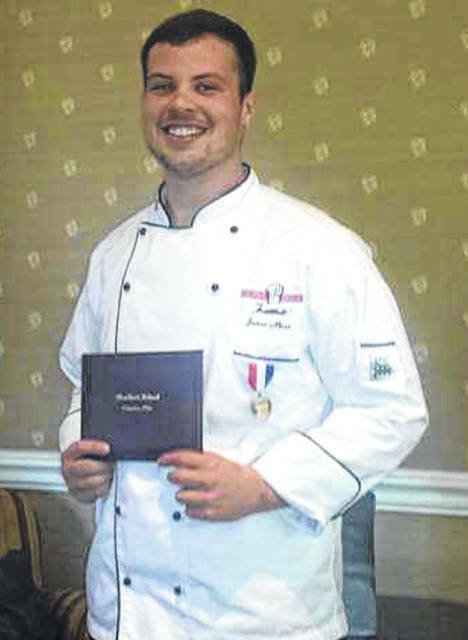 Greenfield native James Mann has a chance to study as a chef in Sweden. Growing up in a single parent household with a mother who worked full-time, James Mann often found himself preparing meals for his mom and sister. Cooking grew into a passion, and now the Greenfield native has been offered a chance to train for three months at Faviken Magasinet, a high-end farm-to-table restaurant in rural Sweden. A 2011 McClain High School graduate, Mann already has extensive experience at Columbus area restaurants doing everything from washing dishes to being an executive chef. Now, he wants to take it to another level. The training in Sweden, scheduled for Dec. 8 through most of March, is costly. Mann said he has already saved a decent amount of money, but figures he will need to raise another $5,000 to cover all his expenses. Mann said that in addition to cooking for his family in previous years, he also sometimes cooked from scratch for his friends. He also likes to forage in the woods for things to add to his menus, something he will be asked to do often in the Swedish countryside. After graduating from McClain, he attended Ohio University for one year majoring in mechanical engineering. But he could not afford to continue on that path, so he came home for the summer. That’s when a friend told him about culinary school, and Mann decided to follow his dream. He graduated in 2013 from a 16-month program at the Columbus Culinary Institute, followed by a three-month paid internship. He has since worked at restaurants including The Old Bag of Nails, the New Albany County Club, Ella Restaurant + Bar in New Albany and the Double Comfort Restaurant in downtown Columbus. One day not so long ago he was watching a show on television featuring the Faviken and its chef, Magnus Nillson, whom Mann had long admired. At Faviken, Mann will be considered a “stagiaire,” and will work in different sections of the restaurant including protein, garnish, pastry, chinaware and prep. The restaurant is open Tuesday through Saturday and stagiaires start work around 1 p.m. and finish around 11 p.m. He will live in Are, about a 25-minute drive from the restaurant, in an apartment with other stagiaires from around the world. “I just want to get the experience and recommendations, and the opportunity to network and be able to learn and work with all these other chefs,” Mann said. If anyone would like to help, a GoFundMe account has been set up at gofundme.com/x5chun-culinary-internship or Mann can be contacted directly at 937-763-2339.
https://www.timesgazette.com/wp-content/uploads/sites/33/2018/09/web1_James-Mann-pic.jpgGreenfield native James Mann has a chance to study as a chef in Sweden.